It’s no secret who rules the MPV world; heck, in the time it took you to read this sentence, you may well have seen a couple of Toyota Innovas pass by. Yes, there is some competition in the form of the Mahindra Xylo, but the Innova has held on to the throne and isn’t really too keen on letting go. It’s a household name by now, and that means it will be that much more difficult for a new entrant to go up against it. Well, enter the Nissan Evalia. Nissan didn’t do all that well in India until its Sunny saloon came by, and after that, the sheer number of them should tell you the rest of the story. 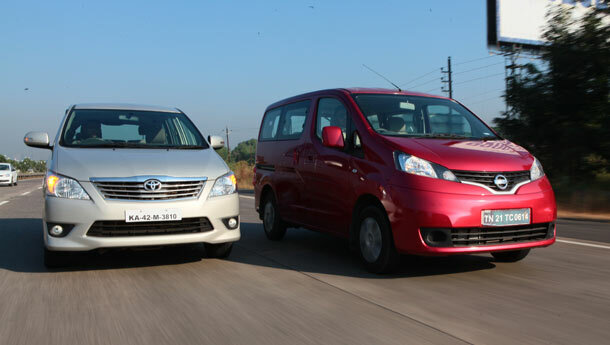 It’s now brought in an MUV that hopes to go up against the Innova, but can it really upset the applecart? So what will your neighbours think of the Evalia? Well, to be honest, they first won’t know what to make of it. If they happen to catch a glimpse of it, tail first or rear three-quarters, they’ll just think you’ve bought a new car and are protecting it from the elements by using a rigid car cover. A more frontal angle will please them, of course, because it looks a fair bit better than the Innova from that angle. The slit-like headlights and swept back look give it a slightly futuristic stance. No need to worry about being driven out of the neighbourhood for spoiling its aesthetics, so long as you back into your parking slot. Even on the move, I found that when I was driving the Evalia, people would always try to strike up a conversation about it at traffic lights and such, but then you can chalk it up to the fact that it’s new in the market, and slightly unusual to look at when compared to other MPVs. No one will bat an eyelid if you were to show up in an Innova, though – they simply don’t notice it. It’s that ubiquitous these days! The recent facelift has given it a new lease of life, of course, with the usual slew of updates like bumpers, headlights and tail-lights, but the basic silhouette remains the same, which is quite alright with us actually. Considering you spend most of your time here, the layout and the quality of the interior matters a lot when you’re about to buy an MPV. So which one would I rather put my family in? Hands down, it has got to be the Innova. It’s not so much about space, because the Evalia seems to have more, but it’s the quality of materials used and the general layout of all the controls. One major thing that the Evalia managed to get wrong is the seats. They are fine for shorter trips, but on longer jaunts your back starts to complain, quite loudly I might add, because there’s not much support on offer. We’re hoping there will be a future version that adds captain seats into the mix! Also, we all have a member of the family that is known for getting car sick on long road trips. In the Evalia, you had better make sure that person is sitting in the front row, or you’re going to be cleaning the interior often because of the fly-type rear windows. They fold out rather than roll down, and that too barely enough to fit a finger through. But hey, at least the whole door slides away for easy cleaning. Not for nothing is the Innova the first choice for people looking for an MPV; the interior looks pretty plain at first glance, but opt for the 7-seater version with two rows of bucket seats and you won’t want to go back to anything else this side of a Mercedes-Benz S-Class. When driving in crowded city roads, I found that the Evalia made me feel more comfortable. The high-up driving position gives you a commanding view of the road and the huge mirrors make sure you’ve got a full view of everything going on around the car. 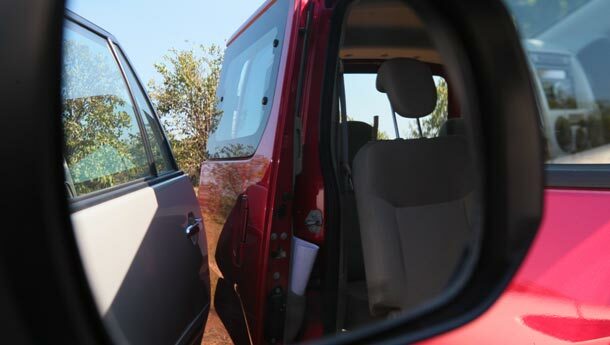 What’s more, the sliding rear doors mean that if you’ve managed to park it in a rather tight spot, you won’t have to worry about dinging someone’s car or contorting yourself to get out. 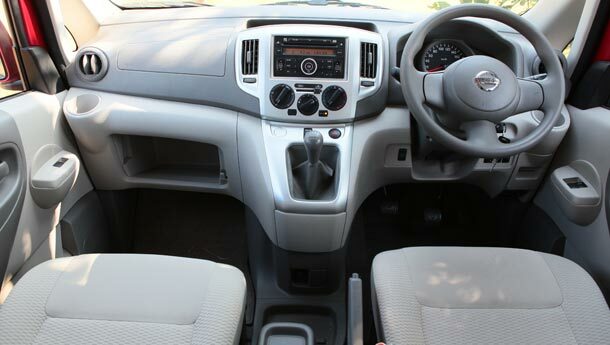 Unlike the Innova, it’s a monocoque design with a front wheel drive layout, so it drives and responds pretty much like a car, albeit one with a higher center of gravity and a steering wheel that feels like it came straight out of a bus. It’s got a turning radius of just 5.2 metres, which means getting out of tight spots should be a breeze, too. The 1.5-litre, 86 bhp K9K motor seems much more eager to pick up pace than the Innova’s unit too, which is great in city traffic. And if you add the fact that it’s lightweight, the Evalia, even on a full load, feels just as quick, save for a bit of lag at the bottom end of the rev range. But past 1600 rpm, there’s ample poke and it lasts all the way up to 3500 rpm. While the motor is tried and tested, what also works in the Evalia’s favour is the location of the gearbox. It falls easily to hand, unlike the floor-shifting Innova that has a rather heavy throw. Short shifting and crisp, the Evalia is tailor-made to make your MPV life a wee bit easier. The Innova, on the other hand, isn’t as great to have in the city. Suddenly, all that vault-like feel and stability starts to seem a little overwhelming. You end up thinking the car is larger than it is, and it feels a little unwieldy too. The not-so-eager engine and somewhat dull brakes exacerbate the problem, and you end up feeling like you’re driving a lumbering mass down the road. The Innova’s strength lies in its gearing – a combination of efficiency and driveability, especially out on the highway. But it lacks a crucial amount of get up and go, which makes it a bit of a chore to drive, especially around town. Out on the open road, you’d think that the smaller 1.5-litre engine in the Evalia will lose steam as you reach the thicker part of the rev range, but you’ll be in for a surprise. It pulls a lot better than its displacement figure would lead you to believe, thanks to its 1426 kg kerb weight. The Innova has a whole litre on the Evalia, but the power delivery is too linear and the Innova doesn’t put its power down the way the Nissan does. Right off the line, the Evalia, at 14 seconds to 100 kph, is a full four seconds quicker and after that, it goes on to clock a higher top speed of 159 kph as well. It has its weight savings over the Innova and the 20.4 kgm torque of the K9K engine to thank for that. There is a downside though; aerodynamic front end aside, the slab-sided van is very susceptible to crosswinds, and every time you pass a truck, you can feel the car shake. 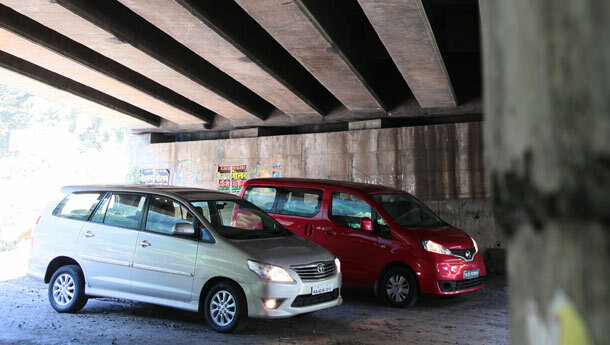 Over our pothole-riddled roads, the Innova also maintains its composure quite well, keeping its body movements in check, while the Evalia tends to bounce around a lot, which can be attributed to those leaf springs at the back. 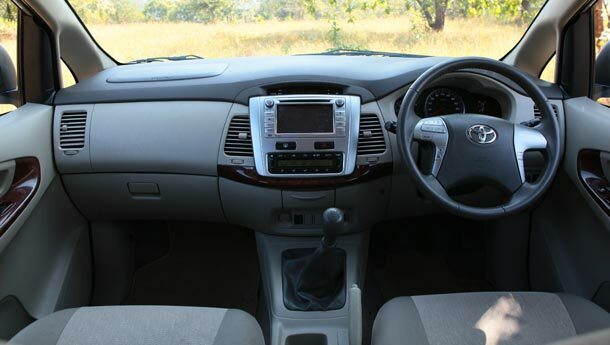 Once you’re up to cruising speeds, the Innova is a very peaceful place to be, ignoring the engine noise, of course. The steering is well weighted, the engine is relaxed (then again, this engine feels relaxed even at the red-line), and the car feels properly planted on the road, so you can maintain high speeds all day without fatigue. At the end of it, the Evalia brings a lot to the table, especially in terms of packaging. 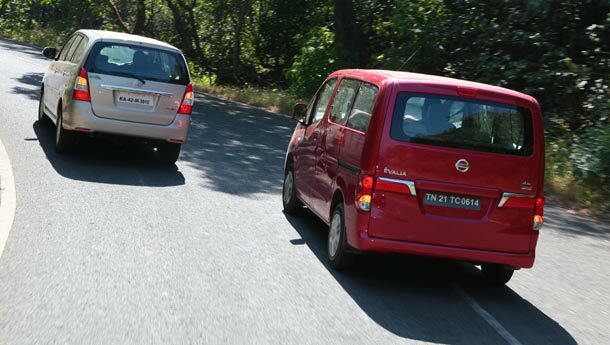 The engine is a gem, the ergonomics more logical and it makes for an excellent intra-city commuter. Sadly, those aren’t the only factors that determine what makes a good MPV. That title continues to rest on the Innova’s fast maturing shoulders. It’s surely more expensive, but it’s a very comfortable, well engineered package with stellar build quality and a peace of mind factor to boot. The wait to upset the applecart continues to be a long drawn one!